During the final months of the London, Midland & Scottish Railway's independence there was frantic activity in its works at Derby. Under construction was Britain's first main line diesel-electric, and H.G. Ivatt - the railway's chief mechanical engineer - was determined it should appear as an LMSR locomotive before nationalisation consigned the company name to history. Already the LMSR had done much of the pioneering work with diesel traction. In 1931 it had built the first diesel shunting locomotive, a prototype design that was later copied with modifications by the other Big Four companies and eventually developed into the standard BR shunter. Seven years later the LMSR had experimented with a fast and futuristic-looking three-coach articulated diesel train. But the landmark year was 1947. On 8 December, only days before nationalisation, Ivatt himself drove the gleaming black and aluminium No. 10000 out of the erecting shop at Derby. The revolutionary new 1600hp locomotive weighed 127 tons and had been designed by Ivatt, working in close collaboration with the private firm of English Electric who already had 20 years experience of diesels. No. 10000's design also drew on the considerable expertise in diesels available in the USA, and there was a distinctly American look about its massive bonnet. It also had 'LMS' in large cut-out letters on the side. An identical locomotive, No. 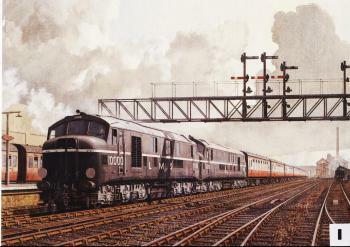 10001, followed in 1948 and for many years the two worked together in multiple - American style - forming a powerful 3200hp combination capable of handing the heaviest West Coast Main Line expresses with ease. They spent some time on the Southern Region in the mid-1950s before returning to the London Midland Region where their decline at the end of the decade coincided appropriately with the mass onslaught of the English Electric Type 4s - the first production main line diesel-electrics. Appropriate because the engine fitted to the Type 4s was a direct descendant of that used in the two LMSR prototypes. After a few years pottering around on local trains and freights in the London area both these historic locomotives were withdrawn - No. 10000 in 1963 and No. 10001 in 1966 - and subsequently scrapped. Sadly, the holocaust that swept steam locomotives away in their thousands during the 1960's meant that preservationists had little time for diesels, however important. Here in their heyday this dynamic duo tear northwards through the now-vanished main line platforms at Willesden Junction. In their wake they leave the fascinating question: how might today's railway look if diesels such as these had been built in large numbers in the early 1950s instead of the standard steam classes?